Four seasons in one day . . . and white asparagus | A balanced diet . . .
I’ve just returned from a week-long trip to Bonn, the former capital of West Germany. And on two of the days, our meetings were held in the former Bundestag (the German parliament building) in United Nations Plaza, just south of the city center, and close to the south/ west bank of the mighty River Rhine. It’s now home to the Crop Trust. The River Rhine, looking southeast from the Kennedy Bridge (Kennedybrücke). I am leading the evaluation of an international genebanks program, part of the portfolio of the CGIAR (now the CGIAR Consortium). The evaluation has been commissioned by the Independent Evaluation Arrangement (IEA, an independent unit that supports the CGIAR Consortium) whose offices are hosted by the Food and Agriculture Organization of the United Nations (FAO) in Rome. Regular readers of my blog will know that for almost nine years from 1973 and 19 years from 1991, I worked for two international agricultural research centers, CIP and IRRI respectively. This evaluation of the CGIAR Research Program (CRP) on Managing and Sustaining Crop Collections (also known as the Genebanks CRP) focuses on 11 (of 15) CGIAR centers with genebanks. 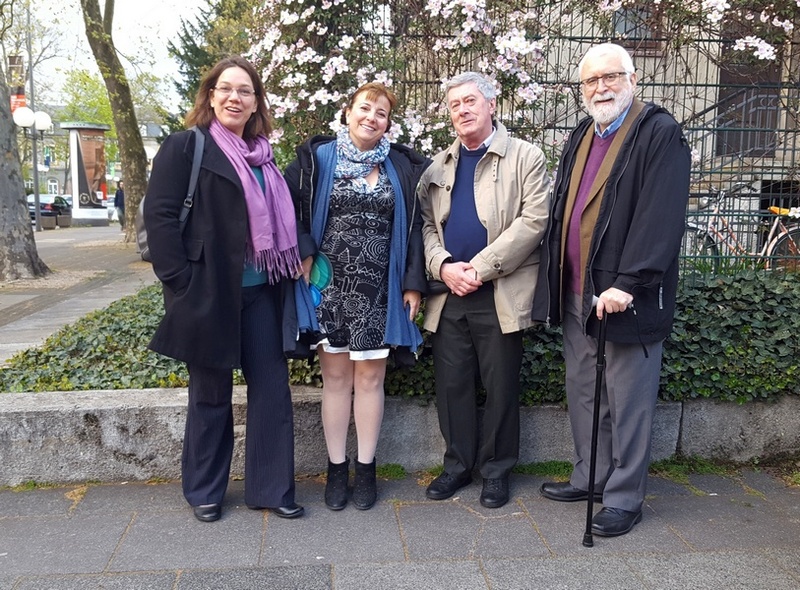 Joining me in Bonn were two other team members: Dr Marisé Borja (from Spain) and Professor Brian Ford-Lloyd (from the UK). Our meeting was managed by IEA staff member Ms Jenin Assaf. Dr Sirkka Immonen, the IEA Senior Evaluation Officer was unable to travel at the last moment, but we did ‘meet’ with her online at various times during the four days of our meetings. On our way to dinner last Thursday evening. L to R: Jenin Assaf, Marisé Borja, Brian Ford-Lloyd, and yours truly. 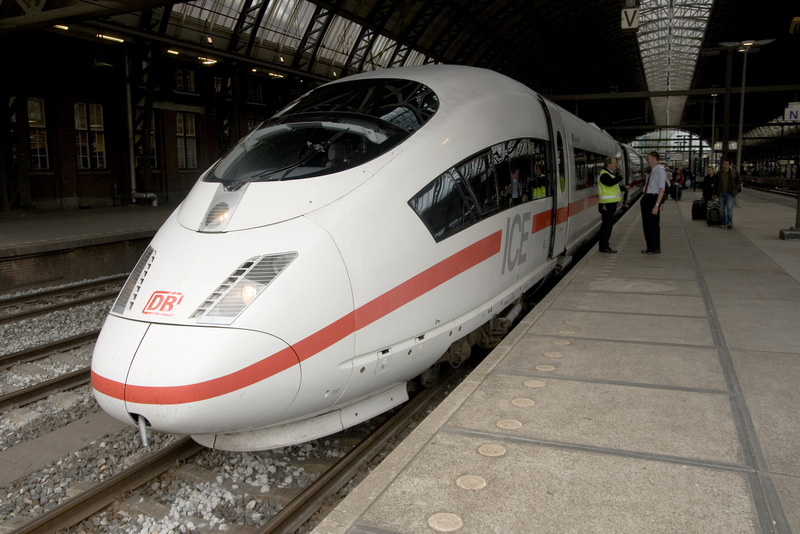 Brian and I traveled together from Birmingham, flying from BHX to Frankfurt, and catching the fast train from there to Siegburg/Bonn, a 20 minute taxi ride into the center of the city. The weather on arrival in Frankfurt was quite bright and sunny. By the time we reached Bonn it was raining very heavily indeed. In fact over the course of the next few days we experienced everything that a northern European Spring can throw at you (as in the Crowded House song, Four Seasons in One Day). Now you can see from the photo above, I’m still using a walking stick¹, and expect to do so for several months more. While walking is definitely becoming easier, my lower leg and ankle do swell up quite badly by the end of the day. I therefore decided to wear ‘flight socks’ for travel. Even so, I had not anticipated the long walk we’d have in Frankfurt Airport. We arrived to a C pier, and it must have been at least a mile by the time we were on the platform waiting for our intercity express (ICE) to Bonn. Now that 40 minute journey was interesting, reaching over 300 kph on several occasions! We stayed at the Stern Hotel in the central market square in Bonn, which is dominated at the northern end by the Bundesstadt Bonn – Altes Rathaus, the city’s municipal headquarters (it’s the building at the far end of the square in the image below). On the first night, last Monday, we met with an old friend and colleague, Dr Marlene Diekmann, and her husband Jürgen. Marlene works for the German development aid agency, GIZ, and was one of my main contacts whenever I had to visit Germany while working for IRRI. Jürgen was the Experiment Station manager for ICARDA based in Aleppo for many years before the Syrian civil war forced the closure of the center there and evacuation of personnel. South of Bonn is the Ahr Valley, a small red wine growing area where Marlene and I have walked through the vineyards in all weathers. It’s amazing how the vines are cultivated on the steep slopes of the valley. Arriving at the end of April, and with the weather so unpredictable, and unseasonably cold, we missed the cherry blossom festival in Bonn a week earlier. In fact, I don’t recall seeing any cherry blossom anywhere in the city. 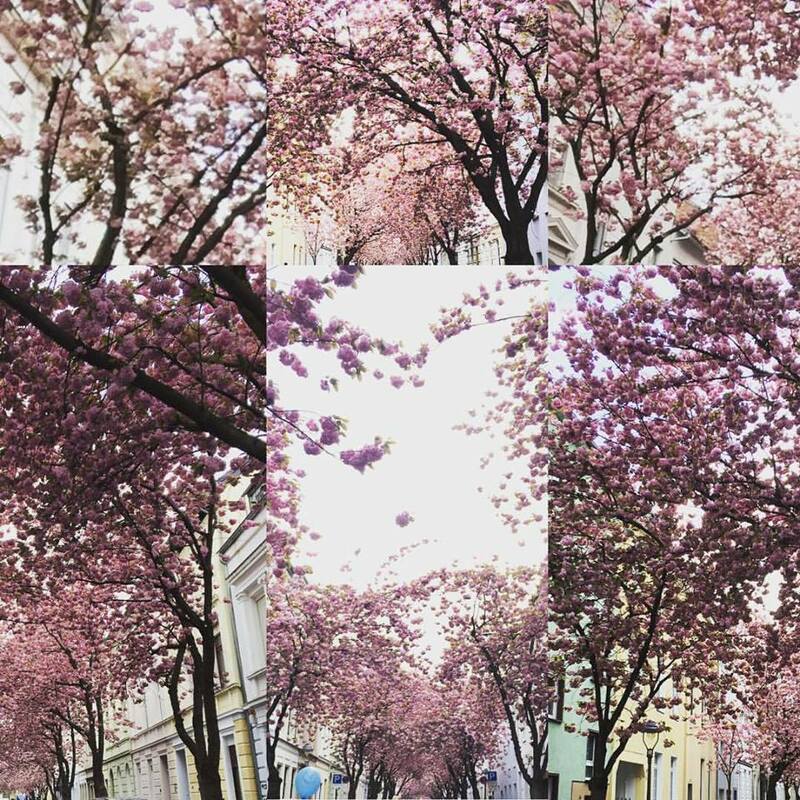 Cherry blossom in the streets of Bonn, mid-April 2016. (Photo courtesy of Luigi Guarino). But there was another delight – culinary – that we did experience, having arrived just as Spargelzeit or ‘asparagus time’ began. With so many food options to choose from in Bonn, Marlene suggested that we should try the Gaststätte Em Höttche, a traditional German restaurant right next door to the Stern Hotel. That was fine by me as I didn’t fancy a long walk in any case. The food was good (as was the weissbier or wheat beer), and we ate there the following night as well. And since it was Spargelzeit, it wasn’t just any old asparagus. But white asparagus! Big, white, succulent spears of heaven. Just click on the image below for a more detailed explanation. Enjoyed on their own with a butter sauce, or with ham, schnitzel or fish (halibut was my particular favorite), white asparagus is offered on most menus from the end of April to June. The Germans just go crazy for it. On the final evening, we had dinner with a number of colleagues from the Crop Trust, at the Restaurant Oliveto in Adenauerallee, less than half a kilometer from the hotel, on the bank of the Rhine. After a wrap-up meeting on the Friday morning, Brian and I returned to Frankfurt by train, and caught the late afternoon Lufthansa flight back to BHX. Where the weather was equally unpredictable – and cold! As far as the program evaluation is concerned, the hard work is just beginning, with genebank site visits planned (but not yet confirmed) to Peru (CIP), Colombia (CIAT), and Mexico (CIMMYT) in July/August, to Ethiopia (ILRI) and Kenya (ICRAF) in October, as well as the CGIAR Consortium Office in Montpellier before the end of May, and FAO in Rome by mid-June. We’ll be back in Rome to draft our report in mid-November. Before that, there will be lots of documents to review, and interviews over Skype. No peace for the wicked! ¹ The walking stick came in handy on the return journey. Waiting in line at Frankfurt Airport to board our flight to Birmingham, one of the Lufthansa ground staff pulled me and Brian out of the queue and took us first through the boarding gate, even offered me a seat until the door to the air-bridge was opened. And we boarded the plane first. This entry was posted in People, Science, Travel and tagged asparagus, Bonn, CGIAR, Crop Trust, genebanks, Germany.